Product #16519 | SKU MT190CXPRO4 | 0.0 (no ratings yet) Thanks for your rating! 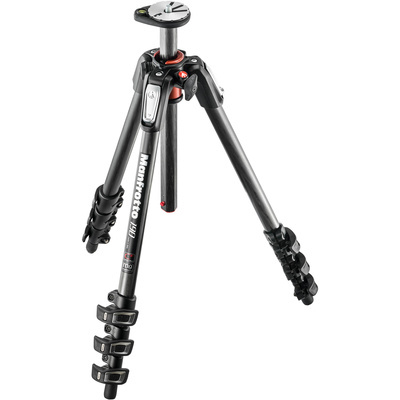 The black, 190CXPRO4 Carbon Fiber Tripod from Manfrotto rises to a height of 146 cm, supports 5kg and folds down to 50cm for storage and transport. The tripod is packed with professional and convenience features that make it a snap to use in the field. Manfrotto's flip leg locks allow easy adjustments of your height. Once set up you can use the 190CXPRO4's rapid center column in standard vertical mode or Manfrotto's Q90 column feature to swing it into horizontal position like a boom with .Tabs for 25, 46, 66, 89° angle selection on each leg allow you to get down to only 8 cm for macro work with the column in horizontal mode. The unique Q90° quick center column system allows the user to move the central column from vertical to horizontal position in just seconds without having to disassemble the column. The ergonomic leg angle selector allows you to compensate for uneven terrain. A leveling bubble, especially valuable for panoramas, is integrated on the magnesium top plate. Manfrotto tubes are made of 100% carbon fiber for the best combination of performance, steadiness and light weight. Manfrotto uses pull winding technology, a special production process able to maximize performance, resistance and reliability.